Pre clinical studies indicates stem cell has a high potential to be used to treat Osteoporosis as it has shown to increase Bone Mineral Density. A bone disease that occurs when the body loses too much bone, makes too little bone, or both. Resulting in weak bones which may lead to a break from a fall or even a minor bump. Osteoporosis treatments include the “basic CDE’s” — calcium(C), vitamin D (D), weight-bearing exercise (E), prevention of Falls (F), and bone-friendly medicines. Pre clinical studies indicates stem cell has a good potential to be used as it has mostly shown an increase in Bone Mineral Density. View a summary of current pre-clinical studies to date. Although the bone looks hard and sturdy, it is actually a living tissue that gets broken down and replaced, with the replacing process slowing down as we age. In general, everyone would begin losing bone density by age 35 and when bone loses too much density it would lead to osteoporosis where the bone becomes more fragile and susceptible to fractures. Women are at a higher risk to develop osteoporosis as hormonal changes that occurs during menopause directly affects bone density. During menopause, estrogen levels falls drastically causing a rapid decrease in bone density. The cause of Osteoporosis in men is still unknown, however research has linked the hormone testosterone to health of bones, and have observed that osteoporosis increased in men that has low level of testosterones. 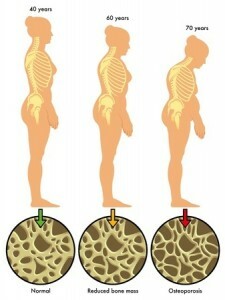 Osteoporosis generally affects 1 in 2 women and 1 in 5 men. Osteoporosis sufferers usually do not know they have osteoporosis until a bone is fractured. However if doctors suspect that you’re susceptible to osteoporosis a FRAX assessment can be made or a bone density scan, also known as the DXA Scan is performed. Once diagnosed with osteoporosis, treatment is usually based on preventive measures such as being selective of physical activities and being careful to avoid accidents leading to fractures. Supplements such as calcium and vitamin D might also be prescribed. 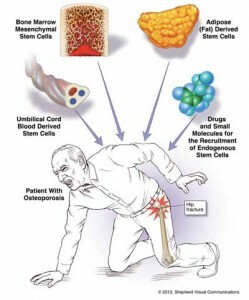 Stem Cell Therapy for Osteoporosis is still in research and investigative mode, however many advances have been made in this field. A summary or research in this field appeared in the journal “Current Osteoporosis Reports 01/2014”, entitled “Stem Cell Therapy for Osteoporosis”, which could be downloaded here. In another research by University of Toronto and Ottawa’s Hospital, a single injection of stem cell has been found to reverse the age-related osteoporosis in mice. Recently University of California, Davis has recently been awarded a grant by California’s Institute of Regenerative Medicine to continue it’s work to develop a small molecule, LLP2A-Ale which directs endogenous mesenchymal stem cells (MSCs) to the bone surface to form new bone. There are many ongoing efforts to understand how stem cell therapy is able to help people with MS. One of the main centres is the California Institute of Regenerative Medicine, where you can view the areas of research being conducted specifically to understand osteoporosis.